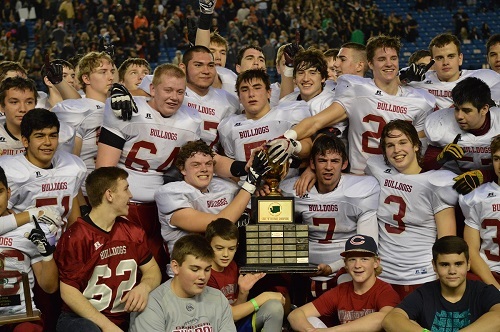 The penultimate game of championship weekend at the Tacoma Dome showcased a repeat of the 2014 title game between the Okanogan Bulldogs and Napavine Tigers in which the Dogs were victorious by the score of 17-14. Competing for the crown a year ago was impressive for the Tigers considering the youth of their core contributing group of players, so getting back to the Woodshed in ’15 seemed like a very likely scenario. Erick Judd has done a fantastic job in guiding the defending champs through the postseason to give themselves the rare opportunity to go back-to-back. The only expectation heading into this game is that it would be exciting; the expected winner was a mystery. Napavine won the coin toss and chose to defer to receive in the second half. Okanogan’s opening possession was interrupted by a strip by Chase Van Wyck that turned the ball over to Napavine. The Tigers marched 83 yards on a dozen plays to log the first touchdown of the game; a thirty-four yard completion to Jordan Purvis. Okanogan wasted no time to even the score when on the third play from scrimmage, they were in the endzone after Mason Guerette hauled in a 56 yard pass from Clay Ashworth. Van Wyck’s defensive effort earlier was rewarded on the offensive end when he recorded the second Napavine touchdown midway through the second quarter. Mac Fagerness got into the action too for the Tigers by catching a 34-yard touchdown of his own. Okanogan’s remaining points of the first half were the result of a 3 yard reception by Riley Prescott. The first half statistics were fairly even, but the glaring difference was the lone turnover of the game which resulted in a touchdown. At recess, Napavine led 20-14. Coach Josh Fay certainly understood the importance of picking up a two-possession lead to open the second half and his team did exactly that. NHS moved the ball 64 yards to the one yard line and let their 6’3”, 225 pound junior quarterback Wyatt Stanley take care of the rest. Okanogan was unable to respond on the offensive end, but they got a minor lift from Napavine when they committed a safety after a botched snap that sailed through the endzone. The Tigers still held a two possession lead at 27-16, but the momentum was shifting back toward the Bulldogs. Early into the fourth, Okanogan pulled closer when Greyson Fields punched it in from three yards out. Less than two minutes later, Guerette shook off multiple Tiger tacklers on the sideline and sprinted to the goal line to give OHS the lead. The shootout continued shortly thereafter when Fagerness miraculously hauled in a pass to the corner in double coverage then hurdled over a defender to retain the lead. The Napavine defense could not hold down the Dogs who found paydirt yet again on a Greyson Fields plunge. With 1:02 remaining on 4th and 1, Napavine needed a stop to keep their hopes of a game-winning drive alive. As the play clock was expiring, Clay Ashworth set up in the gun. He called out orders to his center then suddenly the Tiger defensive line jumped. Ashworth’s hard count was successful! This proved to be the final piece to line up in victory formation yet again. 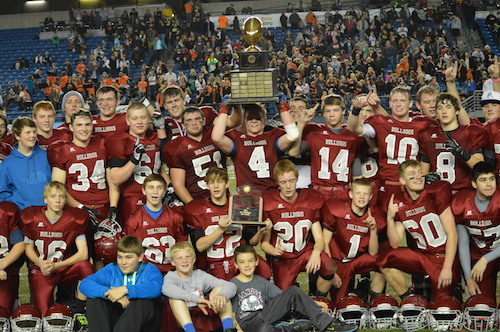 The hardware stays in Northeast Washington for another year. Expect Napavine to be in contention to contend for the title in 2016.